Persistence Market Research offers an 8-year forecast for the residential lighting fixture market between 2018 and 2026. In terms of value, the residential lighting fixture market is expected to register a CAGR of 4.5% during the forecast period. The study demonstrates the market dynamics and trends globally across various regions, which include North America, Latin America, Europe, China, Japan, South East Asia and the Middle East & Africa, which influence the current nature and future status of the residential lighting fixture market over the forecast period. A lighting fixture is the part of a light that is attached to a ceiling or a wall, where consumers can install lighting elements such as LEDs, incandescent bulbs, or fluorescent bulbs. These lighting elements are easily removable from the fixture. Nowadays, traditional lighting fixtures are being replaced with smart lighting fixtures owing to the integration of Internet of Things. Residential lighting fixture are illumination solutions that are created to provide customized lighting to residential places such as apartments, villas, houses, and other set-ups. Based on consumer requirements, some of the residential lighting fixture available in the market are architectural, recessed, tracks, under cabinets, pendants, chandeliers, ceilings, wall sconces, desks, floors, and table lamps. Increasing demand for decorative lighting fixtures in the residential segment and the adoption of energy-efficient products such as LEDs & OLEDs are some of the major factors that are expected to drive the residential lighting fixture market during the forecast period. Increasing penetration of smart lighting fixtures is also expected to fuel the residential lighting fixture market during the forecast period. These smart lighting fixtures offer scheduling, comfort dimming, & synchronization with music, and are compatible with smart home products, such as Apple HomeKit, and can be coordinated through personal assist solutions, such as Amazon Alexa, Zigbee, and others. Moreover, the increasing need for smart homes and buildings is expected to increase the demand for energy-saving solutions and infrastructure such as LED lighting fixtures, which is boosting the residential lighting fixture market. However, lack of proper installation and the availability of low-quality products are some of the factors expected to restrain the growth of the residential lighting fixture market over the forecast period. Owing to the improper implementation of fixture wiring systems, potential customers are likely to find the product unsafe for use, which is also likely to majorly hamper the adoption of lighting fixtures. Moreover, high competition from China-made products is hampering the businesses of regional players in the residential lighting fixture market across the world. On the basis of fixtures, the residential lighting fixture market is segmented into recessed fixtures, flush-mount, vanity fixtures, under-cabinet, outdoor, and others. The flush-mount segment is expected to dominate the residential lighting fixture market with a market share of 21.9% in 2018 and 23.3% in 2026. The flush-mount segment is also estimated to register a CAGR of 5.3% during the forecast period. Based on lighting source, the residential lighting fixture market is segmented into incandescent, fluorescent, and LED & OLED. The LED & OLED segment is expected to create an incremental opportunity of US$ 7,382.7 Mn in the residential lighting fixture market during the forecasted period. The LED & OLED segment is expected to dominate the residential lighting fixture market with a market share of 53.9% in 2018 and 56.1% in 2026. On the basis of pricing, the residential lighting fixture market is segmented into premium (above US$ 350), medium (US$ 200 - US$ 350) and low (up to US$ 200) segments. The medium (US$ 200 - US$ 350) segment is estimated to register a CAGR of 5.0% during the forecasted period. The medium (US$ 200 - US$ 350) segment is expected to create an incremental opportunity of US$ 5,618.7 Mn in the residential lighting fixture market during the forecast period. 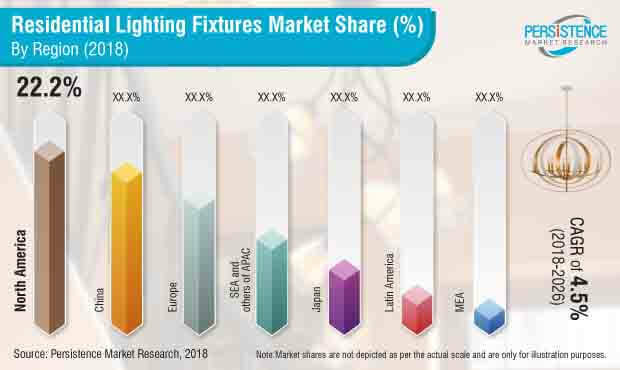 Among the key regional markets, the China residential lighting fixture market is projected to exhibit relatively higher growth in the global market and register a CAGR of over 5.8% during the forecast period. Revenue from the residential lighting fixture market from China and North America is expected to collectively account for over 42.0% of the global residential lighting fixture market revenue in 2018. The providers of residential lighting fixture can focus on expanding across several countries in the SEA & other of APAC and Europe regions. Key competitors in the residential lighting fixture market are Kenroy Homes; Cree, Inc.; L.D. Kichler Co.; General Electric; Koninklijke Philips N.V.; OSRAM Licht AG; Signify NV; Acuity Brands Lighting, Inc.; Panasonic Corporation; Eaton Corporation; and Hubbell Lighting, Inc. A significant number of opportunities are available for vendors in the residential lighting fixture market in the form of smart lighting fixtures and government projects, which will enable them to increase their global footprint. Key players in the market are upgrading their existing products to boost their customer base by improving the experience of customers.